It's not about a handshake; it's about what's in your hands. Technology can be credited for furthering the ability to cultivate customer relationships. That may seem like an odd statement, given that technology is also blamed for the downfall of personal relationship building. But funneling structured, genuine customer engagement through mobile apps and digital technology will create a deeper customer connection unlike any other. No matter your industry, customers need a way to reach you on a continual basis. Before smartphones and Wi-Fi hotspots, difficult circumstances meant interacting with a customer service representative on the phone or simply handling the situation on your own. These challenges can now be resolved with the touch of a button. Now, more than ever, companies are beginning to create an extension of their support teams through branded mobile apps. This same rule applies to a company focused on selling tech-focused and utilitarian products such as HVAC systems. Imagine you're on a rooftop, wiping the sweat from your brow and squinting to examine a failing HVAC system. You received a panicked call from a client, complaining about the rising temperature in the building and the discomfort of all of the employees and customers inside. now you're scratching your head and pondering what to do. This would be an opportune moment for a solution-finding mobile app — an app that guarantees a fix to this mess. This is a common scenario, and for manufacturers who want to connect with customers where they are — even on the rooftop — that means responding in the digital space. 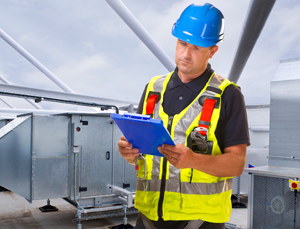 Over the next few years, HVAC manufacturers must continue to rise to contractor challenges and go beyond ordinary customer service. In today's society, many contractors don't have time to sit on the phone to service their customers. Every individual needs answers instantly. The truth is, manufacturers are actively putting the power back in the customer's hands. This new movement will provide contractors with problem-solving technology without ever having to dial a number. These traditional HVAC companies are beginning to understand they must take a step into the new age. No longer does a 1-800 number suffice (though they still exist and dedicated hotlines are helpful). Companies that began with steel furnaces more than 100 years ago are now focused on becoming tech-savvy and mobile-friendly. According to a new Gartner Research Predicts 2015 research note, 75 percent of consumers think companies should make answers to common questions available via smartphone. In fact, customer service via mobile devices is proven to exponentially increase customer feedback. Noted in a recent Forbes article, the average American spends more than two hours a day on his or her mobile device. By creating customer-service centric mobile tools, major companies and manufacturers are able to provide increased value to their customers, while improving customer retention. By digitalizing loyalty programs, product quoting tools and customer service programs, manufacturers realize they're more likely to establish a rapport with their customer in a more reputable, seamless way than before. With a simple download of an app, many manufacturers are taking steps toward cultivating a relationship with customers. And contractors have taken a step toward making the workday a little easier. It's the simplest way to connect and HVAC companies are evolving with these interactive tools. By 2017, 87 percent of the worldwide smart connected device market will be tablets and smartphone, according to IDC (global market intelligence firm). According to a Nielsen study, app usage is steadily on the rise. Back in 2013, mobile owners used 26.8 apps on average per month and spent 30.25 hours in them. Productivity and tools took over 14 percent of that time. This simply means large, name-brand companies must examine whether or not their app is user-friendly. Never has the saying "there are not enough hours in the day" been truer. In the digital age, people expect immediate results, and contractors are no different. Time is money, and any loss of time means one less deal done, one more project left unfinished. It remains the responsibility of any dedicated manufacturing company to put time back in your hands. It's all about going above and beyond regular, run-of-the-mill customer service. New programs, applications and technology will increasingly focus on customer-service tools that make life just a little bit easier. Really, the only things you have to do are decipher which apps suit your needs and download. Simple. Mike Walker, MBA is vice president of sales for Lennox Commercial. He currently leads the sales efforts for Lennox International's North America Commercial HVAC Business Unit and helped develop the Lennox Rapid Replacement program and Commercial Quick Quote proprietary mobile app. For additional information, visit www.lennoxinternational.com.